The grim realities of the late industrial Victorian age gave rise to a peculiarly English type of fantastic nonsense, epitomised by the writing of Edward Lear and Lewis Carroll. It’s little wonder that the collapse of the wartime social consensus in the 1960s, and a Cold War marked by the long shadow of the Bomb, encouraged the same. Like the Pre-Raphaelites they identified with, 60s and 70s art ‘rebels’ in England turned back to the imagery of child-like carnivals mixed up with a large dose of Freud and the odd tab of Acid. 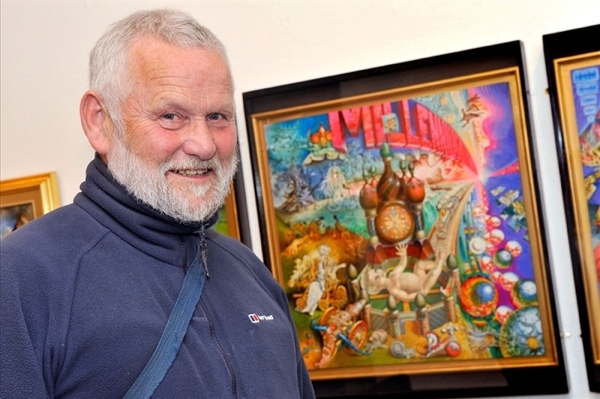 At its worst it could be self-indulgent and narcissistic, but at its best, as in the paintings of Patrick Woodroffe, it had a wonderfully lunatic vibrancy that cheerfully stuck two fingers up at The Man, and the harsh media landscapes of American Pop Art. 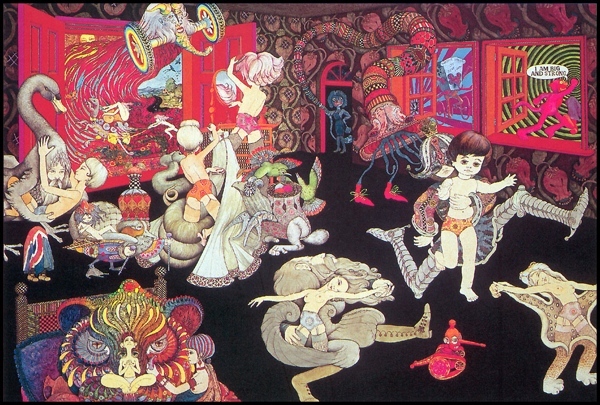 Filled with imagery from nurseries and picture books (especially smiling sun and moon faces) his non commercial works manage to tread the very fine line between infantile fantasy and full-blown freaky nightmare that characterises grotesque art. His 3D painting I’m Coming to Get You is a perfect example. With its benign sun and field of chirpy faces it looks like it belongs next to someone’s cot, but I wouldn’t want it in the house because I know it would give me nightmares for weeks. The fact that a lot of his work was in 3D doesn’t help – all it means is that it looks like all those strange creatures are emerging into our world where they really don’t belong. The Everlasting Covenant is just as bad, and the fact that it’s from a quote from Genesis doesn’t help much. Patrick Woodroffe’s commercial cover art for publishers like Corgi stood out from the rest because of its sheer vibrancy, and the fact that he could give a book cover an incredible sense of place and character, even the images that don’t have strong single figure. 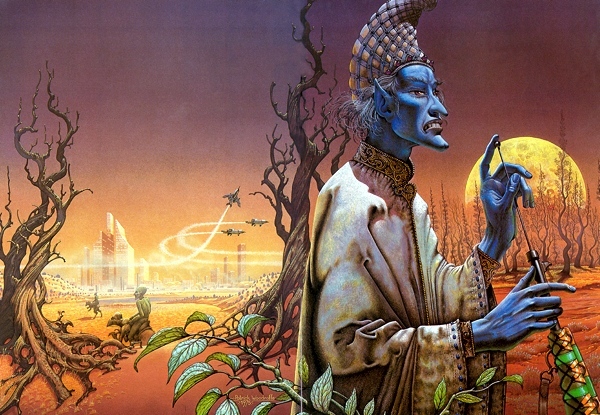 The monstrous blue harlequin he created in 1975 for the cover of the Avon edition of Jack Vance’s The Gray Prince is a perfect example. Clearly influenced by Italian Renaissance portraiture the creature gives off a fantastic vibe of sinister, opulent evil combined with real tragedy. 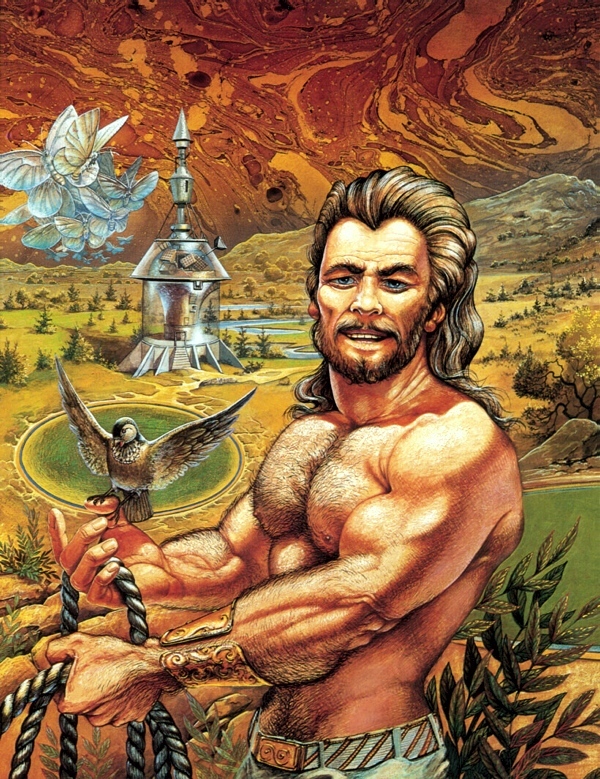 His triptych for Piers Anthony’ s Battle Circle trilogy (Sos the Rope, Var the Stick and Neq the Sword) has the same wonderful sense of both place and person. 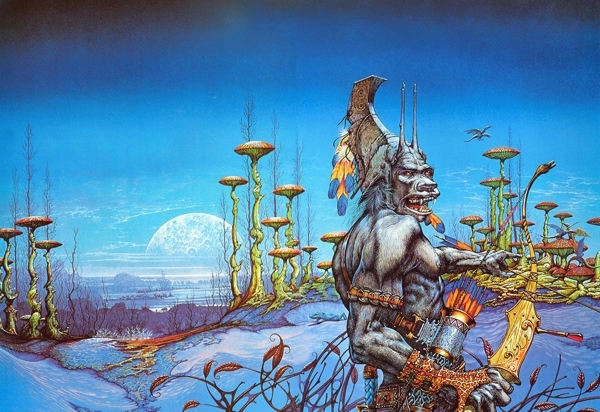 Patrick Woodroffe’s figure work was often exaggerated or distorted, not from lack of skill but rather from the overall fantastic aesthetic he brought to the image. His covers were characterised by bright, vivid colours, a meticulous attention to textural detail and the desire to fill each painting with a wealth of information which rarely overloaded the picture. His covers for the Quartet Corum: The Prince with the Silver Hand series, which he acknowledged were influenced by the fruit and veg portraits of the Milanese painter Arcimboldo, match the baroque intensity of the books themselves and act almost as an emblematic index to the tales of the Eternal Champion. Inevitably given his interests and background, his spaceships were less assured. He also painted covers for such classic hard-boiled detective novels as Dashiell Hammett’s The Big Knockover and Red Harvest which, while unusual, look completely out of place in the context of the stories themselves. Patrick Woodroffe’s website is as quirky and original as the artist. 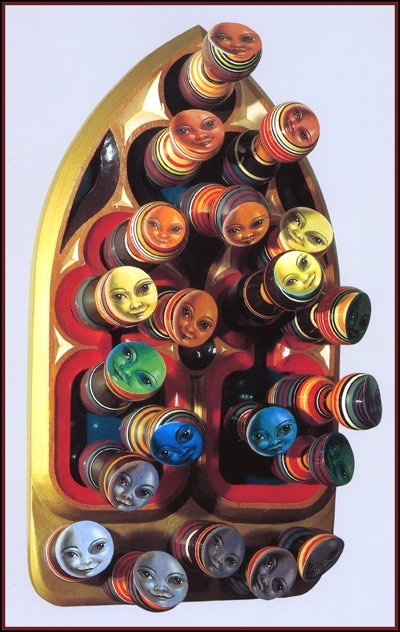 His recent work saw a return to Flemish inspired wooden box triptychs filled with smiling suns and brightly coloured surreal iconography mainly inspired, it seems, by his own naturalist folk art take on Christianity. The dark scary edge has gone from most of the works and even to a grumpy old atheist like myself they represent a joyful and quite beautiful portfolio of works. It’s a real tragedy that Patrick Woodroffe passed away as his art would often lighten up a tired and derivative shelf of covers in W. H. Smiths in the 1970s and he rarely failed to do justice the fantasy books he illustrated. What a wonderful illustrator! Some of it reminds me of the Garden of Earthly Delights. Do you know Claude Ponti, French author illustrator of children’s books. There’s a certain resemblance in the choice of colours and the weird creatures. I see what you mean about Claude Ponti – the colours and some of the imagery is similar. Bosch had a massive upsurge in popularity in the 60s with a lot of fantasy artists. I think it was because his insane imagery appealed to the whole psychedelia movement. The mix of Freud, Jung and Acid that played out in music, writing and art saw a fellow traveller in Bosch, even if his ideas had absolutely nothing to do with Freud or, as far as I know, LSD!